Thanks for posting this. I am mulling over what to do car wise in September. I won’t actually save anything if I was to have someone drive me to and from work than actually hiring out a car but then the convenience of it would be useful. Looking back, would you still advise buying a car over renting and would you recommend a qashqai or would it be ok to get something smaller?I know that I could save by buyingbut then I hear stories all the time of the headaches involved dealing with insurance, if you have an accident and general servicing etc.. Also life here can be precarious and I don’t want to be stuck with a car if I have to leave the country. It’s all down to choice whether you rent, buy or get a regular driver. There are benefits in renting – no insurance or repair costs etc but that is at a cost of monthly payments – I felt I was going to invest four or five years of my life in Qatar so buying seemed worth it. Of course, one can’t anticipate the future so buying always has some element of risk attached. My wife has a regular driver. Getting a good reliable driver can be difficult. She’s had a whole bunch of drivers who were rude, used the phone while driving, dirty cars with non-functioning seat belts, and worst of all are never on time. The record wait is nearly 2 hours – when she phoned it was repeatedly every 10 minutes, the response was always ‘in 5 minutes ma’am. She now has a great driver… and sorry we’re not sharing him! For me, buying was the best option, particularly having transport available whenever I want. I have not heard of insurance problems from anyone I know who has had an accident. I pay extra insurance to get any accident repairs done by main dealership rather than some shop on the Salwa Road. Unless it is written-off in an accident or irreparably breaks, I will use it until we leave. I also wanted the warranty, which apart from free battery replacement I haven’t had to use. Servicing is only a short drive up C Ring. In financial terms I am already financially better off having bought a car. 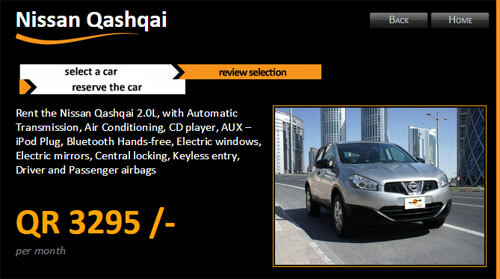 I went for the Qashqai because it was the best value crossover. High driving position and fairly robust in the case of an accident. Similarly priced Hyundai Tuscon didn’t have a passenger airbag. The Toyota Rav 4 was more than I wanted to pay. I could have gone for the Renault Duster for around 58,000 – much cheaper but I didn’t feel I wanted a car built in Romania by Dacia. I wouldn’t recommend a new Qashqai now as the model has already been replaced in Europe. New cars seems to have Ramadan offers at the moment. I went for new, but if you believe the press, there will be second hand nearly new bargains to be had from departing expats. People seem to expect you to haggle, so if you see something advertised on Qatar Living, offer low to start with. I don’t know anything about buying second-hand in a private transaction. Good luck whatever you chose to do. Maybe you can post back here and tell us what you did and your eventual reasoning. Nissan Qashqai is a good choice. although James May may disagree on the Duster and Kia Sportage comes with the highest safety rating in the class. I’m also mulling over getting one of these (mulling Insha’llah !!). For servicing you mentioned C-ring road, do you mean the garage street next to La Cigale? Are they any good?